In Azerbaijan, the Kremlin’s action convinced even those who had doubted it before that they could have no future inside the USSR. Indeed, the day after the killings, many Communist Party members there, including some of its most senior leaders, tore up their party cards, an action that showed there would be now going back. And elsewhere in the USSR the message Gorbachev and the Soviet leadership hoped to send backfired. Both where many were already seeking independence from Moscow and where few had yet thought about it, Soviet actions in Baku 18 years ago today did not intimidate but rather destroyed the fear that had kept the USSR together. In addition to urging the west to give Azerbaijanis their due, he also argues that citizens themselves should never forget the critical role they played in bringing down Soviet rule. They should resist the urge to look back on those days with nostalgia. I draw slightly different conclusions about the lessons of January 20th. In contrast to Ukraine, I've never noticed much nostalgia among Azerbaijanis for the good old Soviet days. Sure, folks lament that infrastructure has deteriorated and things used to work better, but I've never heard much yearning for the days when Moscow called the shots. In contrast, in some parts of Ukraine and Belarus, Soviet nostalgia is practically a religion. Ironically, I've heard more nostalgia for the latter days of Heydar Aliyev, who felt secure enough in his position to loosen the reins a bit on free expression and association, than I ever did for the days of Soviet rule. While this is an important lesson, especially for Ukraine, I'm not sure it's the most important one for Azerbaijan. Goble argues that western countries look at Muslim countries like Azerbaijan primarily through the prism of their conflicts with non-Muslims. I agree that it's a mistake. ....And on the other, because so many people in the West then and now view predominantly Muslim countries like Azerbaijan only through the prism of their conflicts with non-Muslims and as the objects of history rather than its subjects, they are unprepared to acknowledge the independent importance of what happens in these states. The continuing failure of many in Western countries to do so reinforces a highly selective, culturally myopic view of the historical record. And far more seriously, it undermines the chances that Western countries and the peoples of these countries have to work together. I would argue that, these days, the west still fails to address Azerbaijan on it own terms. When they bother, westerners think about Azerbaijan, not through the prism of its conflicts with non-Muslims, but on its ability to play nice in the GWOT and keep the oil flowing to Europe. This myopia hinders the country's democratic development and diminishes the memory of the people who died on January 20. That one corrupt state with no public legitimacy has been replaced with another, albeit one with substantially more resources and more savvy at playing the free election charade, should surprise precisely no one. Azerbaijan is now "the leading jailer of journalists in Europe and Central Asia," there's little to no democratic space for political parties or NGOs to operate, rule of law is a fantasy and the kleptocratic elite fly petro-dollars out of the country by the ton on pallets. Even the most incremental and superficial improvements are applauded by the west, which breathes a sigh of relief as it turns a blind eye to Azerbaijan's Putinesque system of "managed democracy." I'm not sure this is exactly what those courageous people had in mind for the future when they faced down Soviet tanks on a cold day in January. 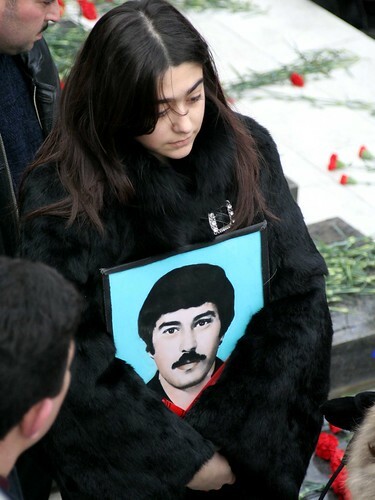 Instead of pining for Soviet days, Azerbaijan needs a cadre of leaders who are brave enough to demand transparency in the oil sector, to insist that they get a say in the disbursement of the country's riches and expect that leaders plan responsibly for the the country's future, taking into consideration the views of all Azerbaijanis, not just those of elite clans. All of these require substantial acts of courage and a willingness to challenge the fear, passivity and venality that plagues the country's domestic political scene. The west needs to look beyond its short term stability interests and seriously encourage rule of law, transparency and the development of an active civic culture. Stability uber alles. Everyone wants it, but for completely different reasons.